Time for a little roadtrip. We are heading off to visit Dan's parents in upstate New York for a few days. We're leaving the chicks in good hands though -- don't you fret. We've got Antonio on retainer and he'll be keeping busy at Henbogle freshening the cat food, walking Fishy, and taking care of the chicks -- when he isn't busy scraping the barn, painting the barn, or mowing the wretched lawn. Fishy will be in heaven with Antonio around --finally someone on hand who actually likes to give belly rubs! Whoo hoo! We might be able to squeeze in a garden visit or two, or a trip to a nursery with Dan's mom while we are there. Last year while we were visiting, we made some trips to various gardens. 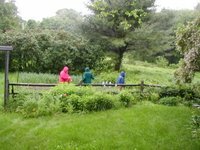 My favorite was Innisfree Garden, (one of my favorite scenes was this misty water feature) but the gardens and grounds at the Institute for Ecosystem Studies was a close second. We also toured the Vanderbilt Mansion in Hyde Park -- very posh but so stiffly formal it is like stepping into a painting, not a garden. 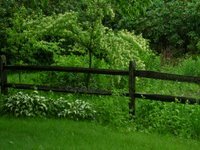 I am looking forward to some good chats and seeing what Mom has done with her garden -- they just moved in last fall, so there is a lot to do, but the place has great bones, with some beautiful mature shrubs and trees, and great bird habitat. We'll be working on some home handyman projects while we're there, too. Dan has the circular saw all packed and a selection of assorted tools and widgets. After all, it wouldn't do to take too much time away from our DIY projects -- we might lose our edge. As the rain clouds rolled in, Dan and I abandoned all hope of mowing the lawn and decided to build a twig tuteur. We are fortunate that in our "back 40" feet of overgrown mess (future woodland path) we have lots of saplings to thin and use for such projects. 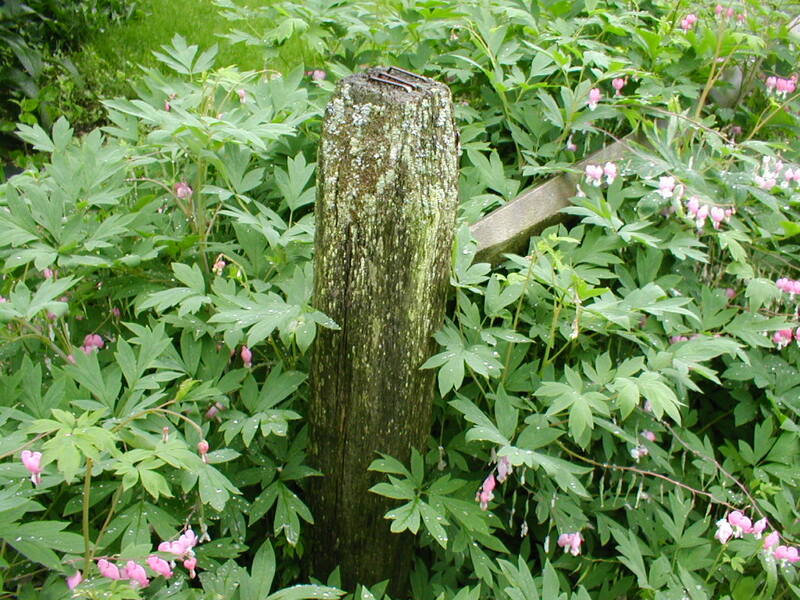 And while we are back there we almost always thin out some of the invasive brier roses. Today's project came out great -- this is the third one we've made and we are getting more skilled. 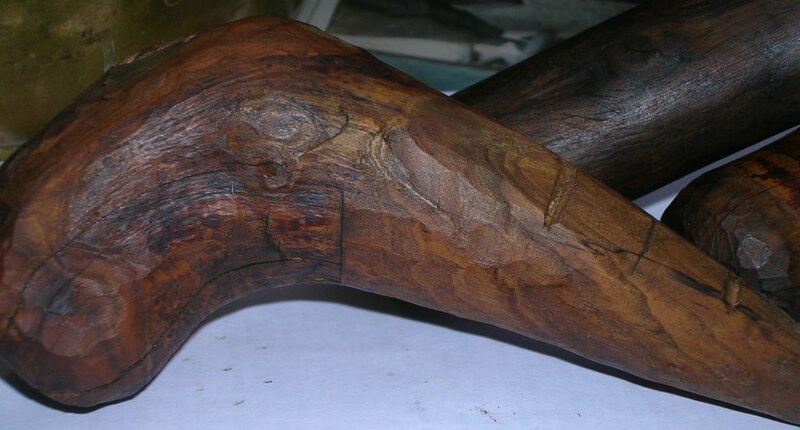 Once the wood dries out a bit, we want to coat it with polyurethane to make it a bit more weather resistant. 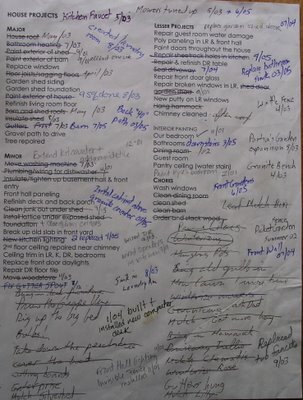 We created this list 5 years ago when we bought the house. As you can see, we've made some progress, and have also changed some priorities. (The priority changes are usually the result of some unfortunate discovery.) We both agree, crossing things off this list is a fantastic feeling. 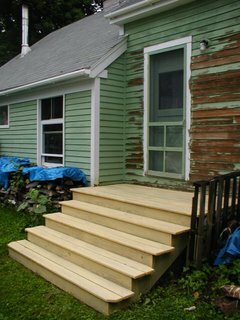 We've been having another stretch of damp and rainy weather, but during some breaks in the rain, we managed to stain the steps off the back of the barn. We hope this will help these steps last a new more years before we have to replace them. We had to debate over staining and mowing the lawn -- in this case, the lawn will have to wait. Antonio has made excellent progress with scraping the barn, and we power washed lots of paint off the back wall, too, so we are now just waiting for things to dry out enough to sand and paint. In addition to painting the barn, we've got to do the dormers on the house (we'll rent scaffolding for that) and stain both decks. Those are the big projects of the summer, although some of the smaller projects are not that much smaller. 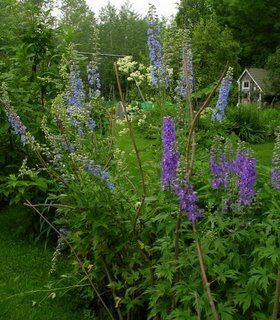 In the gardens, the delphinium, white meadow rue, mountain laurel, white astilbe and purple salvia are blooming now, along with the deep pink peonies. 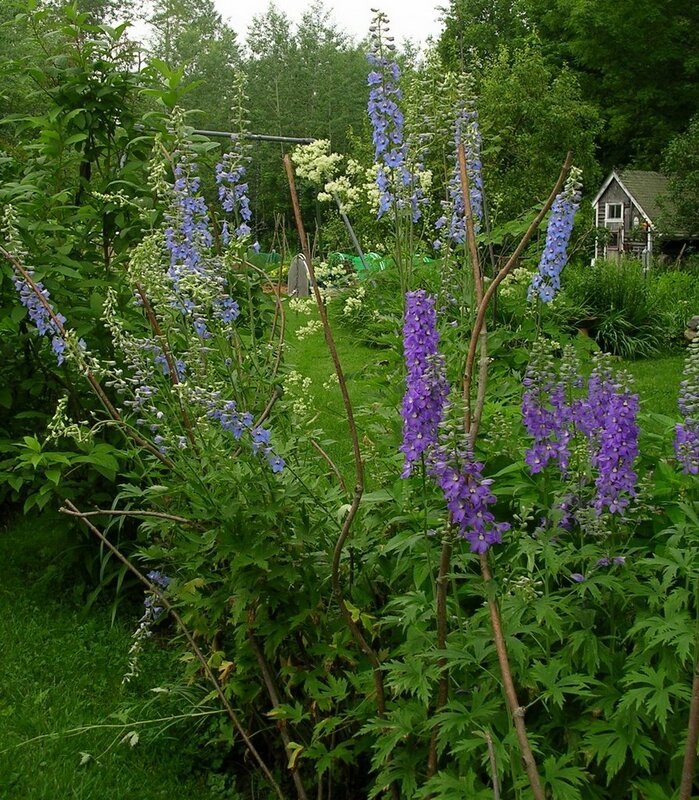 The delphiniums love the cool wet weather, until flowering time, then the rain can really beat up the blossoms, especially as I have yet to find a staking method I like for the delphiniums. Usually the peonies and the purple salvia look great together, but the rain really flattened the peonies this year. I n addition to working on house projects, we have been walking every morning for a good hour with our friend Lynn of Pics-elated. I hope we get a routine established that will survive Lynn's 3-week trip out west. Although Dan and I know the long brisk walks are good for us, it seems like there is so much else clamoring for our attention that it is hard to stick to the routine andspeaking of routine, time to get ready for this morning's walk! Yesterday, despite the rain, we managed to get more planting done in the vegetable garden. 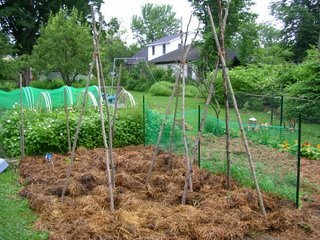 A few days ago, we turned over the soil (again) and weeded, and then mulched heavily with straw. (See the before image on the right). We planted the pole beans, and our squashes -- zucchini, yellow summer, delicata, and winter luxury pumpkins, just moving aside the thick layer of straw to plant the seeds. We planted the delicata and pumpkins under the pole beans, which I've never tried before -- I think will like having the extra space. The final step, a liberal sprinkling of Sluggo to prevent our bumper crop of slugs from devouring the young seedlings. We still have the Painted Mountain corn to go in next to the row-covered cole crops, but we need to finish turning over and weeding, then fertilizing, that section of the garden. We had overwintered some red-twig dogwoods there, so that section still needs some work. We have a tarp down, hoping the sun on the tarp would kill or maim the weeds, but apparently the sun is vacationing this week. Of course, Hogdemort the evil groundhog is still a problem, sigh. We discovered that he has dug a hole under our garden shed again, this time at the back. We have a tried and true method to encourage relocation. We will dump the used cat litter into the groundhog den (we have three cats, and use biodegradeable compressed pine sawdust pellets as litter). It will make the shed a tad unpleasant for our use for a few weeks, but it is a very effective strategy for moving the evil rodent out. 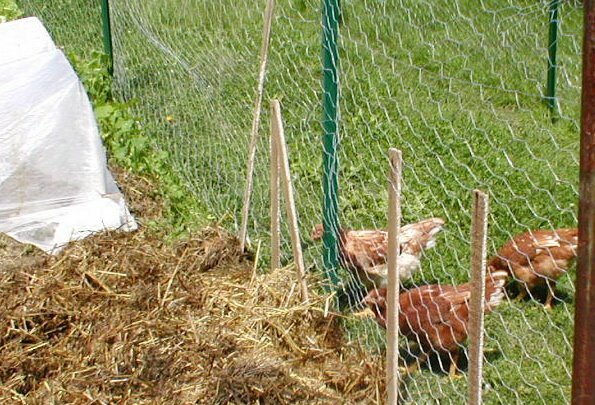 That will only relocate the 'hog, so last night we bought some plastic poultry netting to fence the garden in (I've long surpassed the $64 Tomato). We hope between the floating row covers, the new fence, and the not-very-effective dog, he will choose to move on rather than dig under the new fence. Honestly, I'm a big animal lover (three rescued cats and a rescued golden retriever, and the animal shelter gets most of my charitable contribution dollars) but the groundhog is enough to make me buy a gun. And use it. 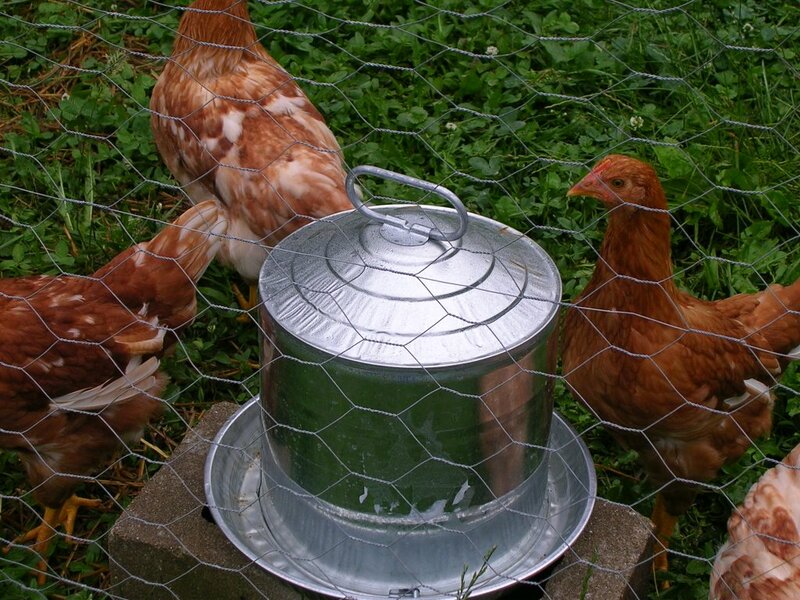 We bought a second water jug for the chickens, to make sure they always have a good supply of water available, one inside, one outside. This one is metal, and they seem fascinated by it. Who knows what transipres in the brain of a chicken. I have always loved beautifully made tools -- perhaps the legacy of being the daughter of a dyed-in-the-wool do-it-yourselfer and hardware store owner. When Dan's mom and dad recently moved, and we went to NY to help, among the many items Dan's mom sent home to Maine with us were these gorgeous dibbles Dan's grandfather made. Louis Milliot was a civil engineer in New York who worked on, among other things, the construction of FDR Drive in Manhattan. His father, Dan's great grandfather, owned a florist and nursery business in Yonkers --Dan's gardening genes go back several generations. Louis carved the dibbles from roots or branches. 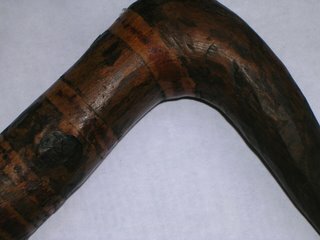 I don't know what kind or kinds of wood he used, the wood is quite hard. 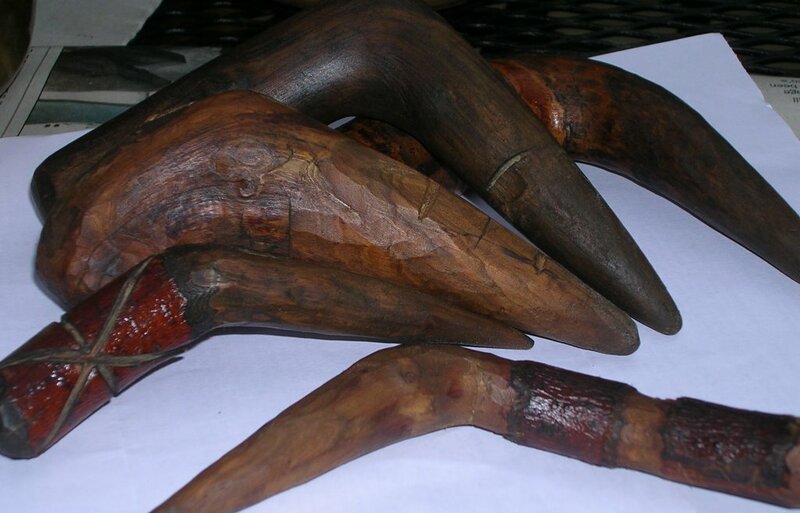 He cleverly shaped them to use their natural details to enhance his carving. If you look closely at the dibble to the left, you can see a knot which looks like an eye in a bird's head. The marks on the beak are lines placed 1/2 inch apart, used to gauge planting depth. I love the striped handle of the dibble to the right. On others he left the bark on, perhaps to give the handle a better grip. One dibble was clearly used a great deal, and even to me, feels just right in the hand. It was hot and muggy here today, and after dinner, I sat on the deck overlooking the garden and cleaned them up, then rubbed a little block oil into them. Aren't they beautiful? The valerian is blooming like crazy right now, and attracting all kinds of pollinators. I love the way it looks against our garden shed -- somehow the warped and rotting siding looks romantic through the screen of the lovely flowers. That's a change from my usual state of fretting over when we'll have time and cash available to replace the shed siding. Walking this morning with my friend Lynn --who is a great photographer and posts many of her photos to her blog Pics-elated --inspired me to post a flower shot. 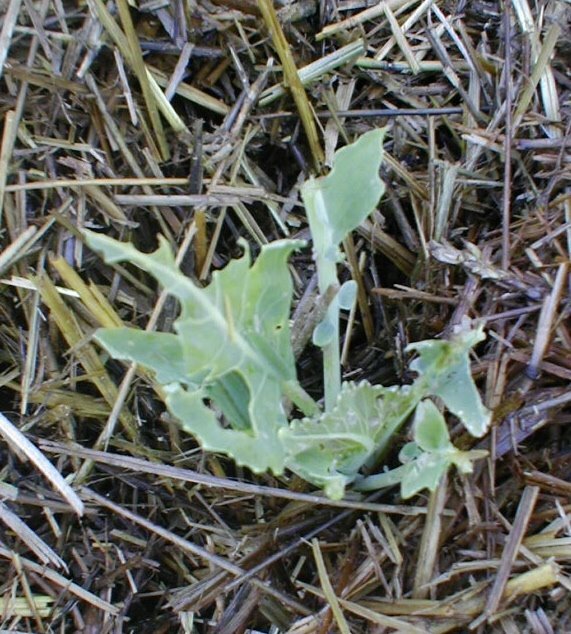 Removing the floating row cover from the broccoli and cauliflower this morning, I gasped in dismay at the sight of my poor ravaged little plants. Hogdemort the groundhog had screwed up enough courage to sneak under the loose cover and let loose his incisors on my poor plants. Looking further, I noticed the rainbow chard had also received an unwanted pruning. Clearly, my defenses were lacking. 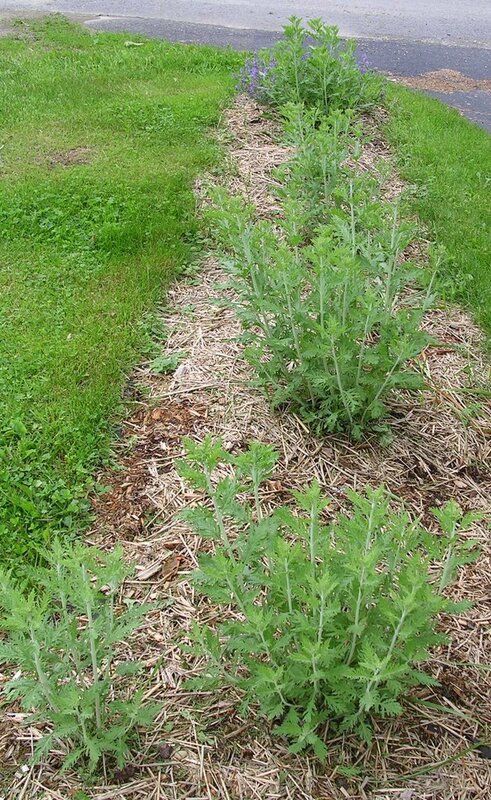 First, the plants needed a gentle weeding and a side-dressing of good organic fertilizer. 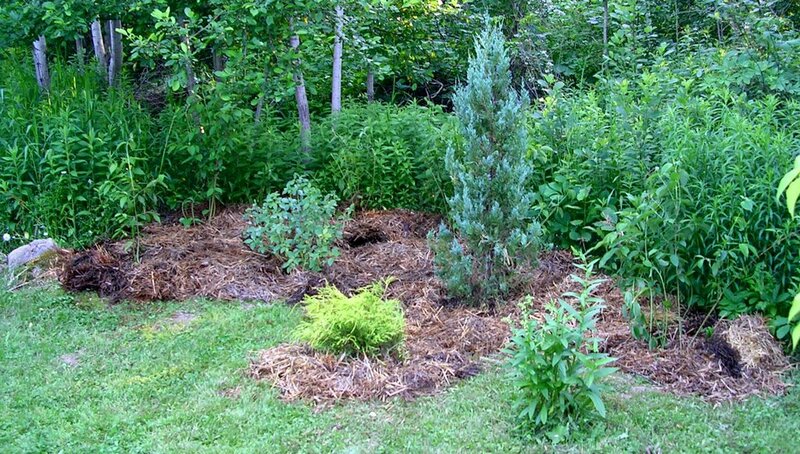 Then we mulched heavily with organic chopped straw. The straw is from a fellow in town building a timber-frame straw bale house -- after the bales go in, the excess straw is chopped off with weed whackers. We collected a huge pile just from the garage but Dave tells us there will be more in a few weeks when the house walls go up. 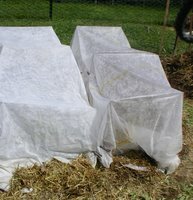 After spreading the straw, we sprinkled Sluggo organic slug control about liberally, then replaced the floating row covers, this time, pinning them to the ground on all sides. It isn't pretty, but the broccoli and cauliflower are worth it. The c hickens, whose run backs up the broccoli patch, apparently are not very good about scaring off Hogdemort --perhaps they need training?-- but they were very curious about the whole process today, and got very excited about the area right next to the pen where I weeded, and the soil was all stirred up. 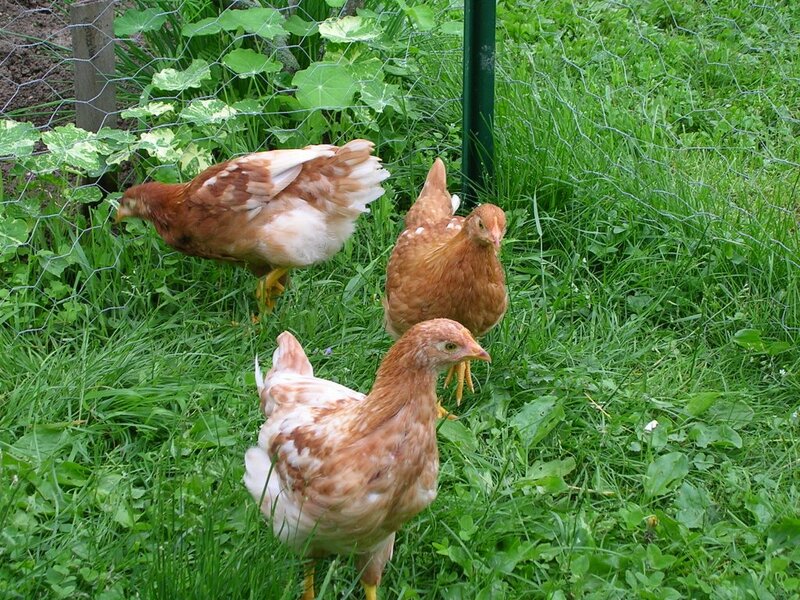 They pecked and scratched away at the soil, looking for bugs. Yay chickens! 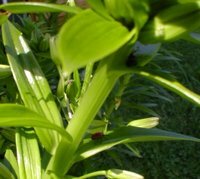 Too bad the chickens are not closer to the lily bed, because later this afternoon, I found 3 more lily leaf beetles, 1 munching away, 2 of them busy creating new beetles. (See them on the right in the photo, the single bug shows more clearly, the other two are on the leaf above.) Well, I hope the beetles enjoyed their last moments, because I had my rubber coated gardening gloves on, also know as my bug crushers, and believe me, those beetles won't be eating another bite of my lilies. With all the straw off our freestanding deck (where it had been temporarily stored) we were at last able to clean it off, and prepare it for staining. Late this afternoon we rented a power washer. Being 1) powered by a 6 horsepower Honda motor, and 2) loud, naturally, Dan was in heaven. He washed the deck really well, and then used the washer to scrape the flaking paint off one side of the barn, preparing that for painting. 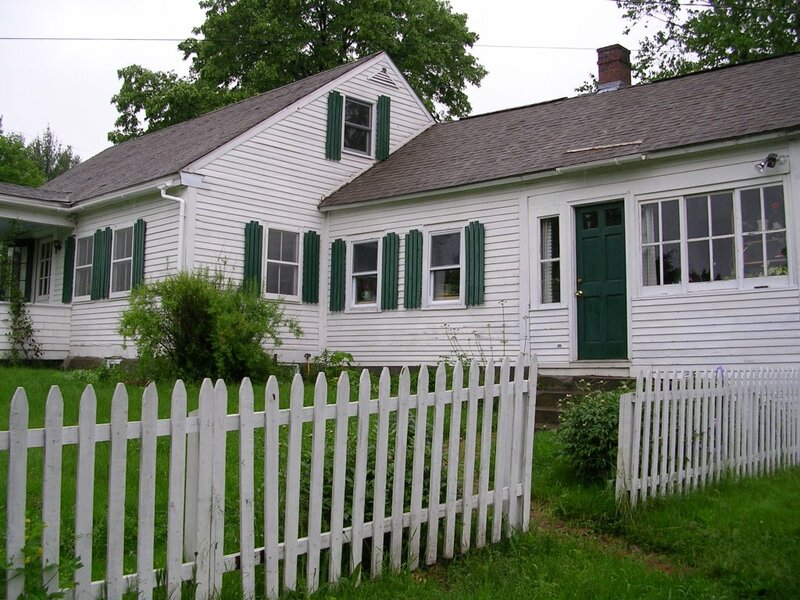 We've outsourced the barn painting task to our friend Karen's son Antonio, who is busily earning cash for college -- this fall he'll be heading off to the University of Southern Maine. Antonio scraped paint for a couple of hours today, I'm sure he'll be pleased to see the progress we made with 20 minutes of pressure washing. There is a place for power tools in my world, especially in the hands of my man Dan. Thanks to All Things Maine for reporting on Four Bears in a Caribou Tree, which I would have missed. Apparently, the onlookers needed as much watching from the game wardens as the bears did. That I can believe, as I vividly recall my days in Greenville, where visiting the dump to watch bears was a regular treat, although the stupid human tricks were more entertaining than the poor bears. I actually saw a father hold his toddler on the back of a black bear while another friend held a bottle of beer for the bear to drink. Yikes! Leave it to the Norwegians to save humankind from starvation. I heard a story on NPR this evening about a seed vault in a remote area of Norway less than 1000 miles from the North Pole. The Svalbard Global Seed Vault can store up to 3 million crop seeds from around the globe, and will be protected by the area's hungry polar bears in addition to its remote location. Read about it here at the New York Times. We had a very disappointing morning in the vegetable garden. 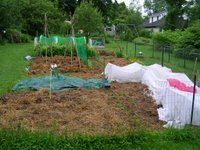 Our poor beets and Swiss chard plants are being choked out by weeds, but our heavy soil is still to damp to really work – even hand pulling the weeds removed big clods of wet soil, too frequently with the nearby desired plant in the clump. Our potatoes, planted a day or so before the heavy rains, are spottily sprouting, and also in need of some weeding. What do we do? 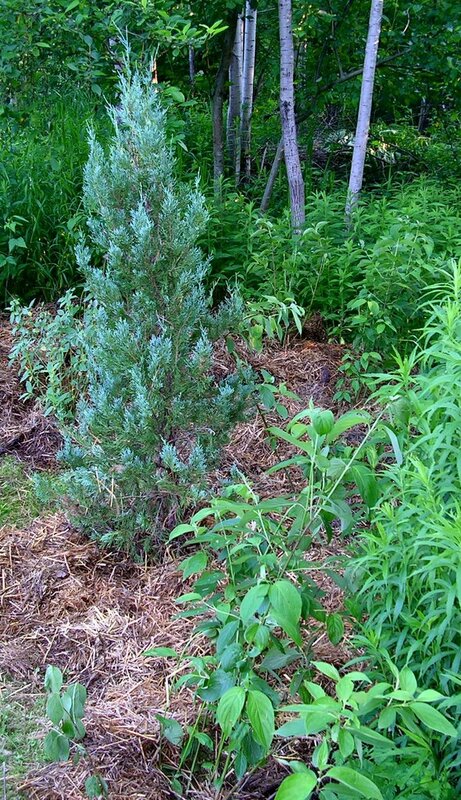 The plants are still too small, if even sprouted, to mulch heavily, and what if we need to re-plant? Big, big sigh. Both Dan and I think raised beds are the answer, it is just getting there that will be painful – the three raised beds that were here when we bought the place desperately need re-building, and we haven’t managed that yet. 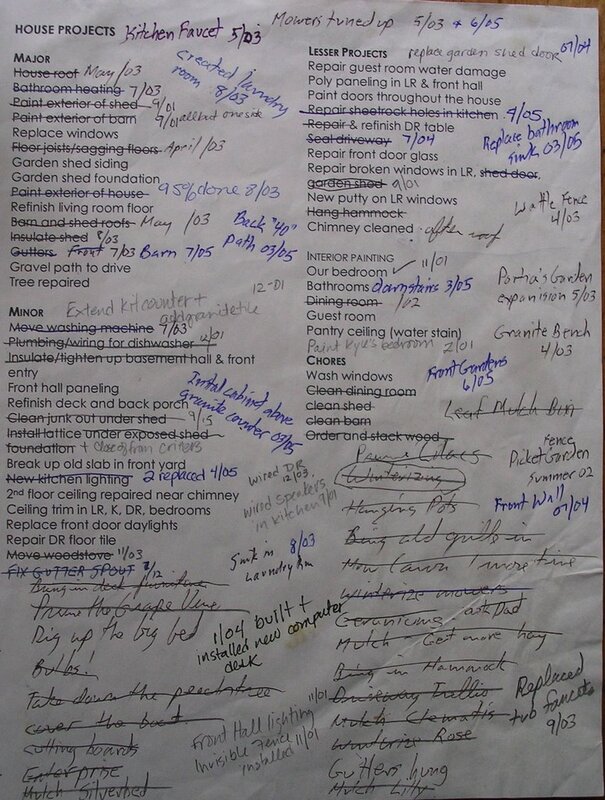 Oh well, we’ll see how the list goes this summer, maybe we’ll manage after we cross off some of the biggies (finish painting the house and barn, stain the new deck, clean and stain the old deck, etc., etc.). We did manage to dig the red-twig dogwoods we had over-wintered in the vegetable garden and plant them. 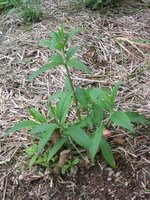 We planted 5 in the back corner of the mowed area, right along the west side property line, and just before our overgrown back 40 feet (which someday will be a woodland garden). 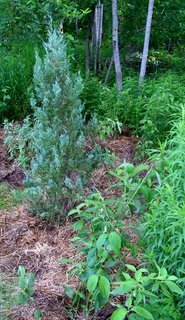 It is hard to tell, but the dogwoods are planted in the back of the mulched area. We bought a yellow-twig dogwood at the Bowdoinham plant sale last month, and planted that amidst the red-twigs. 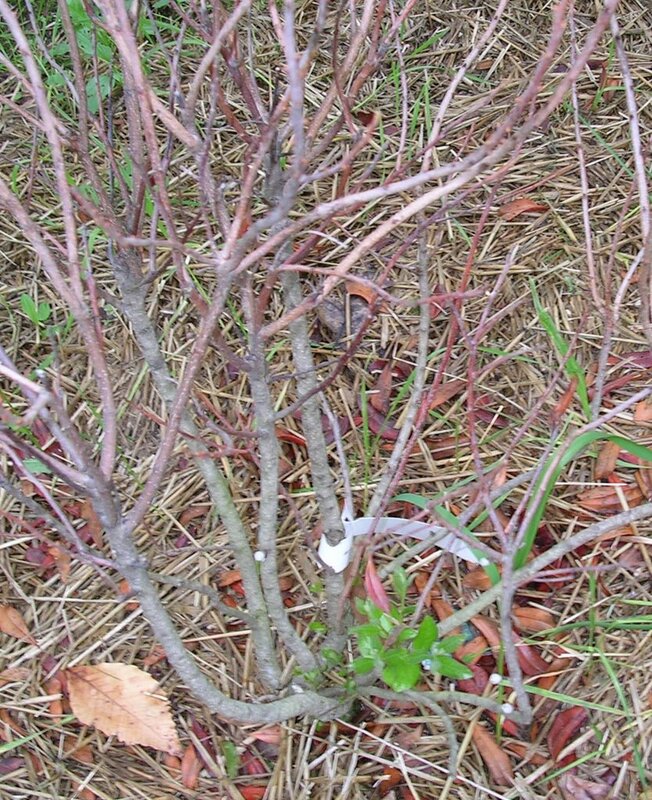 We pruned off some of the largest branches, and beginning next year, we will prune one third of the each shrub every year, thus generating lots of young bright red (and yellow) branches for winter interest, and keeping them in check, as they tend to readily sucker. This area is starting to look really good, the vision I am working toward is looking as good in reality as it does in my mind’s eye – amazing! We planted one red-twig dogwood in the front g arden, near the stone wall and visible from the kitchen windows, which will give us nice viewing in the winter. 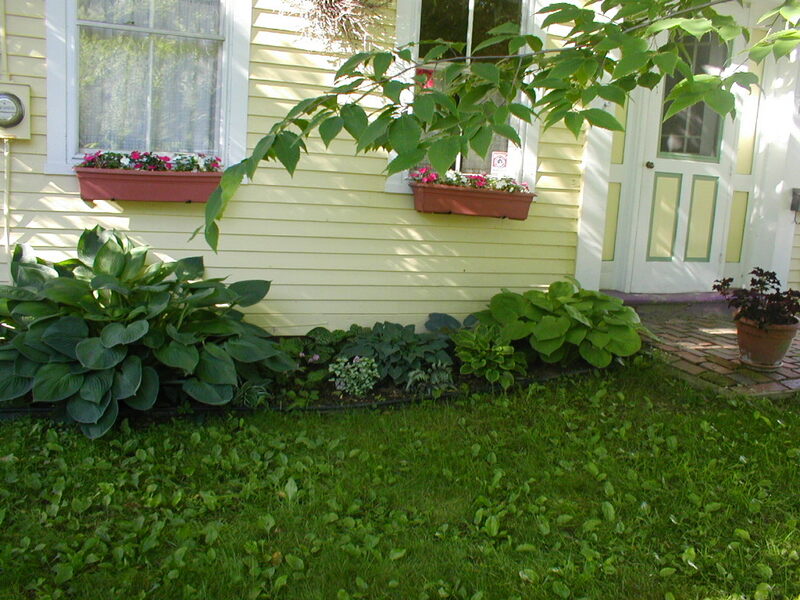 When the yellow-twig plant is larger, we can add some of that in front as well. This garden is also beginning to look really terrific. 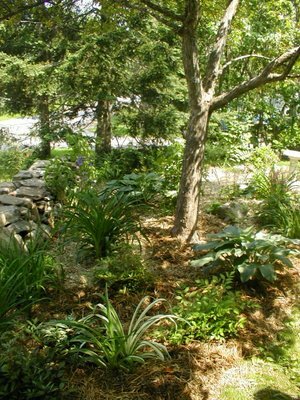 Those little plants are starting to fill out, and there’s a nice mix of texture, form, and color – and less lawn to mow! Next step here is the hypertufa walkway. 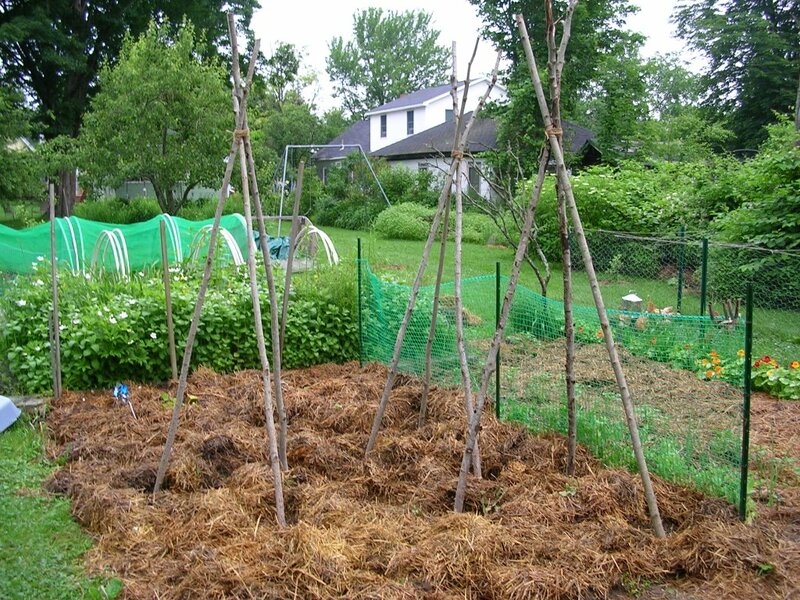 The clear sunny weather will be good for continuing to dry out the vegetable garden, perhaps later this week I’ll be better able to weed then mulch heavily with straw. At least the salad bed is producing well, and the tomatoes and basil are coming along splendidly, too. There is some hope for good eating later this summer. The summer is off to a good start. Today, we went yard sale-ing in the Brunswick area, treating ourselves to a delicious bagel at Mr. Bagel in Brunswick for breakfast. We scored at our second stop, where we found a beautiful D-handled compost fork. We've been on the lookout for a new one, as one of the tines on our old fork is bent making its use difficult and occasionally hazardous. Most of my favorite garden tools have been obtained through yard sales, as I'm a big fan of high quality tools, especially with oiled ash handles, which are hard to find today, (try Johnny's Selected Seeds) and pricey when you do find them. I also like the vibes that come with old tools. A few years ago, we bought an old red wheelbarrow at a sale at an older, obviously well-loved home with beautiful gardens in Topsham. I like to think about the role that wheelbarrow played in making those gardens, and now plays in our gardens. Yard sales are a good source for old plastic ware, too. Most of my favorite hypertufa molds came from yard sales, and yard sales are definitely the best place to find old ceiling lamp fixtures, which I use to make hypertufa Japanese-style lanterns. Yesterday we also found some old plastic pitchers that we are using with the rain barrels to water the gardens (and by the way, I really like the rain barrel system better than I thought I would. 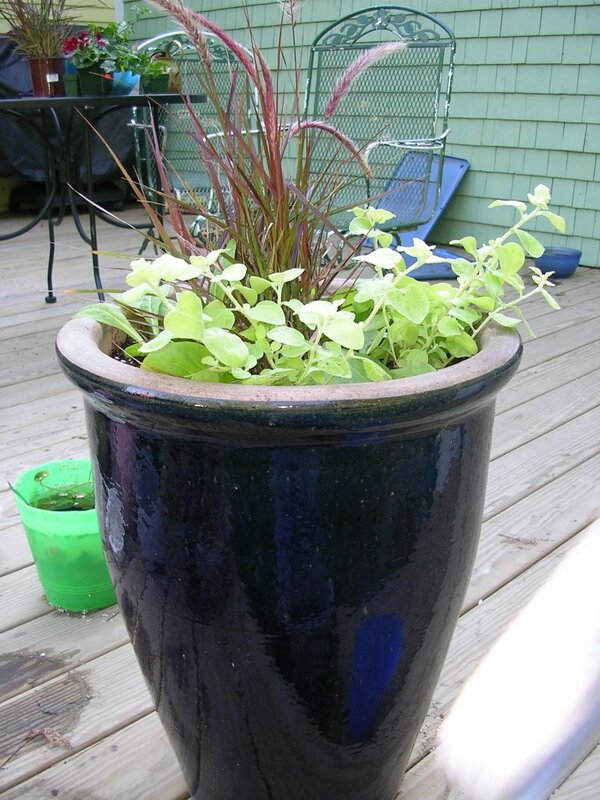 We are not saving huge amounts of money, but having a rain barrel nearby to dip water from is much easier than dragging a garden hose around). We found a few more odds and ends sale-ing, but by 10 am we were headed home to our garden projects. We spent the midday planting the deck planters, and setting up the various birdbaths in different spots in the yard. Within a few minutes of filling one birdbath, I saw a robin splashing about and getting a drink. I'm pleased the birds appreciate our efforts. 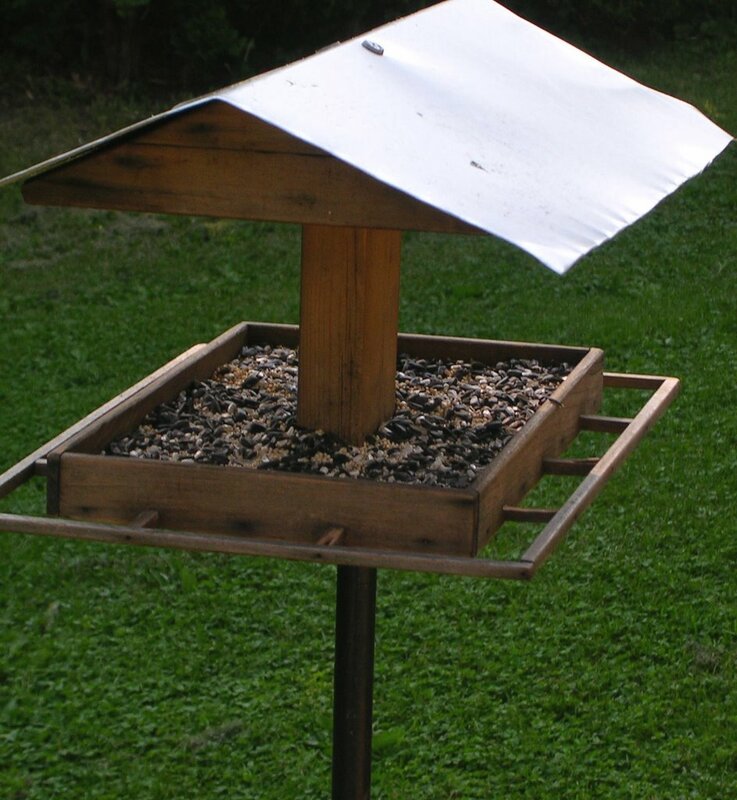 We also installed a new bird feeder purchased earlier this year at a yard sale, and have already seen a female evening grosbeak at that feeder. The last chore of the day was mowing the lawn, ugh. Mowing is great motivation to keep moving forward with my grand plan of lawn reduction --no, make that elimination. 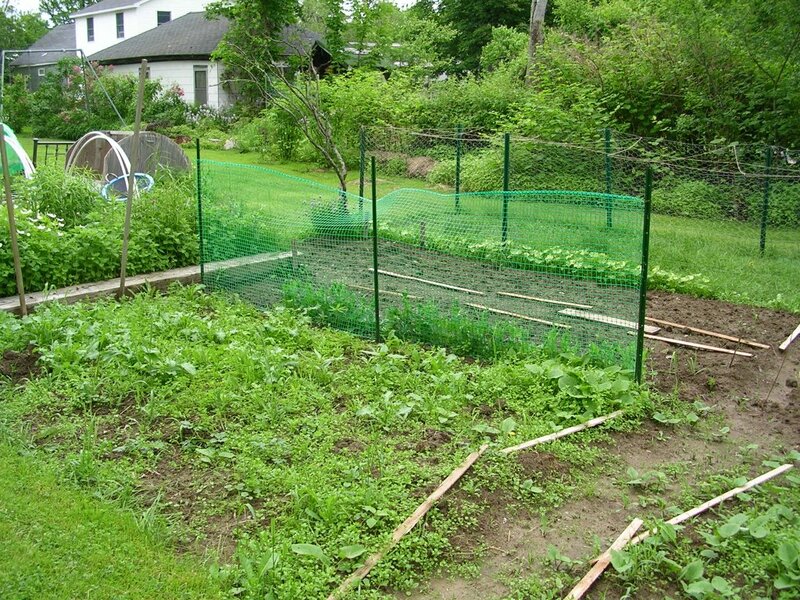 Tomorrow, we will tackle the vegetable garden. Dan and I comitted to offering a hypertufa workshop to some of his teaching colleagues early next month. I am really looking forward to it, but realized, I'd better get my hypertufa house in order first! Last night Dan and I brought out from storage the remainder of our tufa treasures. We filled 2 of the birdbaths, but have one remaining to set up and fill, I want to make a new base for it. 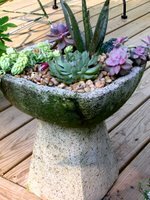 I planted a collection of suculents in one of the tufa pots a few days ago, it is high time to fill the rest with flowers. 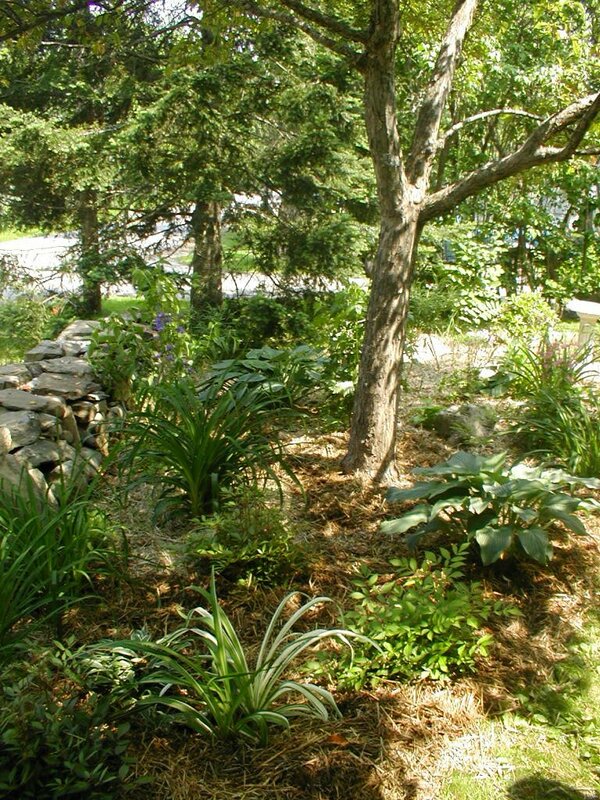 What I really want to do before the workshop, though, is build a tufa pathway in the front garden. Much of the soil there is bank run gravel, with a thin layer of topsoil over it, and whatever compost spilled over from our improvement efforts. 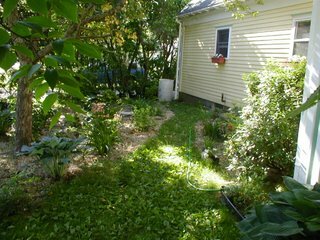 Between the bad soil, and the shady site, the lawn in the front is mostly weeds, and mowing the path between the garden beds is tedious -- although much less tedious than mowing the lawn before the beds were created. 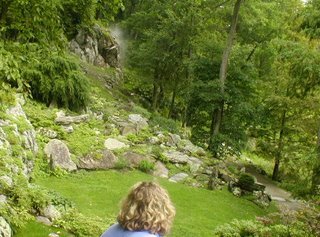 Given that, I think it is the perfect site to experiment with a hypertufa "stone" path. 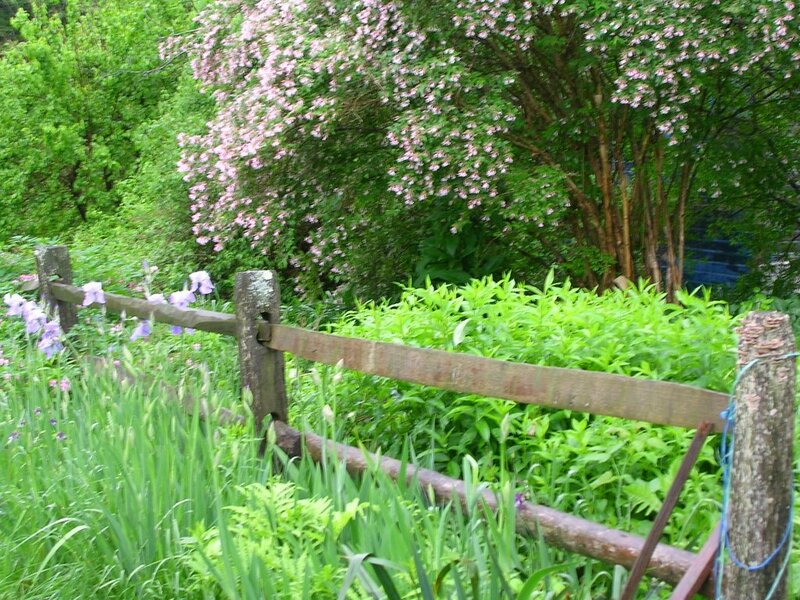 We will run the path from the brick front step, through the beds to the lilacs. The plan is to dig flagstone shaped holes in the lawn, removing the sod and exposing the gravelly base. We then wet the base well, then fill the holes with hypertufa mixture, and cover with plastic to cure, watering the edges well for the next 24 hours to prevent the area from wicking moisture away from the hypertufa. I hope to work on it this weekend, after we do some more work in the vegetable garden. 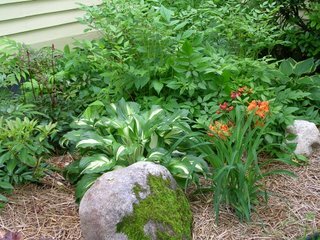 Over time, it will get mossy as the peat decomposes, and it will look more natural and I think blend in really well with the house. If it works, then we move on the the rest of the back yard. I really will need a cement mixer. The gates of freedom swing wide -- summer vacation begins! Yee Haw, this was the first day of summer vacation. Dan has some workshops Friday, Monday and Tuesday, and I have a few more reports to finish up, but we are officially done with the school year. We celebrated by visiting some nurseries from the list in the current People Places and Plants magazine. Dan needed to make a quick trip to his school, so we decided to continue on to Rockport, Maine and visited Hoboken Gardens and Plants Unlimited. Both places had good selections of well-cared for plants, annuals in 6 packs, perennials, and woody shrubs. 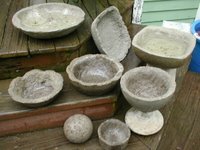 I was especially impressed with Plants Unlimited, which had a huge selection, including some more unusual annuals, a great selection of native plants, and some gorgeous clay and pottery pots. I am always dismayed when I visit locally-owned nurseries only to find a vast sea of impatiens, wave petunias, marigolds and the like, and the same old selection of dwarf Alberta spruce, Japanese barberry and Euonymus. These dime a dozen varieties can be found anywhere, especially the big box stores, where they are usually less expensive. 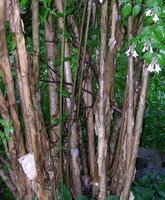 That is just what delighted me about Plants Unlimited today – yes, the Euonymus and petunias were available for the unimaginative, but they also had the native plants mentioned above, and some interesting annuals such as the Hyacinth Bean Vine. I’ve read about the Hyacinth Bean Vine often, (supposedly it was a favorite of Thomas Jefferson at Monticello) but until today, have not grown it. Yep, one came home with me today, as did a pot of variegated Society Garlic, Tulbaghia violacea, and from Hoboken Gardens, some gorgeous Begonia rex cv. Taurus Painted Leaf. 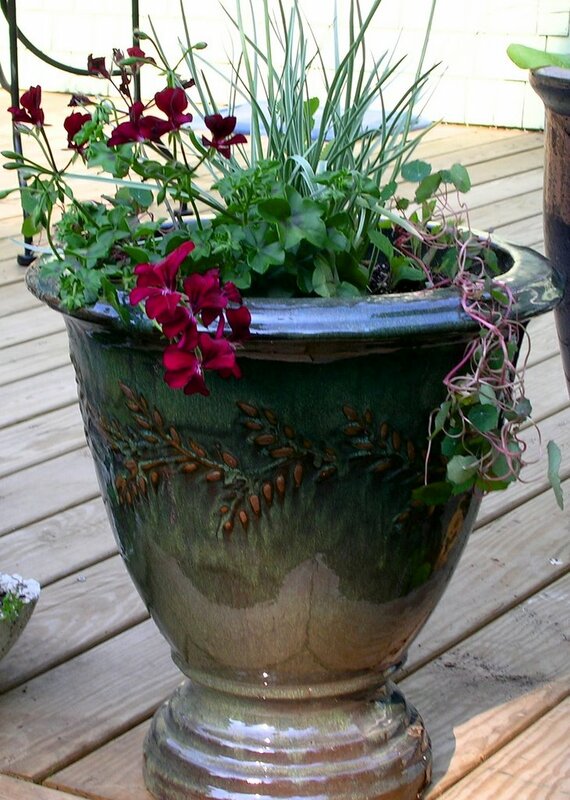 The Society garlic will add good leaf texture to the silver garden and the begonias will look great in the big clay pots in the front of the house -- and won't be the same planter collection seen in the big box circular. Sunday morning we awoke again to rain. A check of the rain gauge indicated we had received an additional inch of rain. Glumly Dan and I looked at one another, contemplating another June weekend in the house. We puttered around a bit, and then I said, "let's go to Longfellow's." Glum faces became cheery smiles at the thought of strolling through greenhouses full of blooms. I of course had an ulterior motive, Dan has a birthday looming, and I thought this might be a good opportunity to scope out some gift ideas. We were really just going to look -- no new plants. Really. 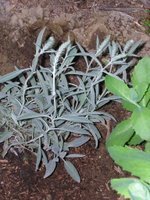 We bought a Silver Speedwell (Veronica incana) for the silver garden, which still has some holes after we yanked out the too-floppy artemesia, and lost several Lamb's Ears (Stachys byzantia). 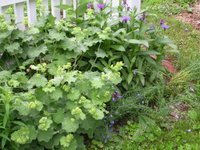 According to High Country Gardens Silver Speedwell has deep blue flowers held stiffly on 10” tall flower spikes and blooms in late spring, but with deadheading will keep blooming all summer. Sounds good. I also added a Salvia verticillata Purple Rain to the cart. 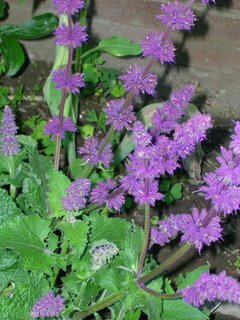 I love salvias in general, and this one I find especially appealing, -- and I think it will look great against the back wall of our yellow house. There are several more salvias on my wish list, however, and I'm thinking I may need a bed of just salvias. 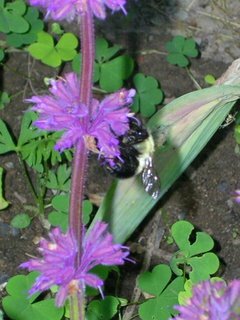 One of my favorite plants of all time is salvia viridis (see it here at Johnny's Selected Seeds), I just love the colors and it is one of the few plants the neighboring woodchucks did not dine on my first year in the house. 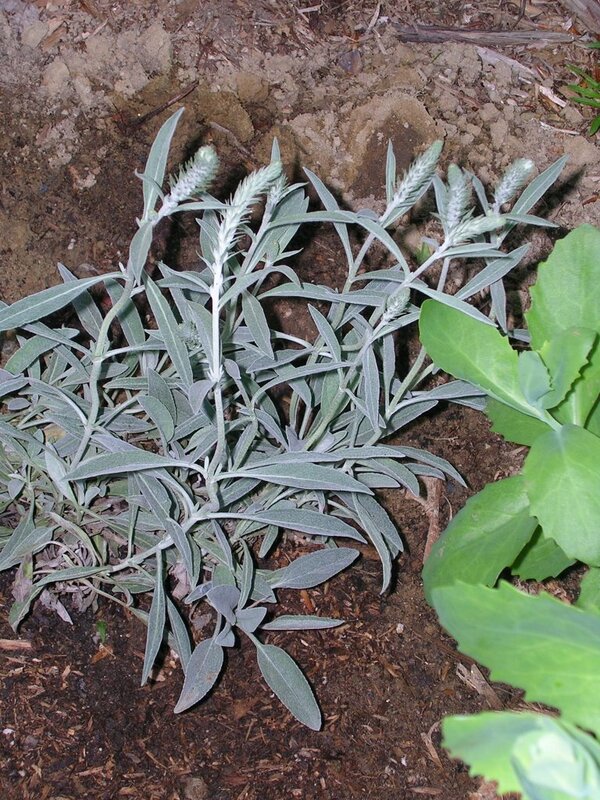 We were good, really, as the only other plant that came home with us were 2 Limelight Licorice (Helichrysum petiolare) plants for the big blue pot on the deck. 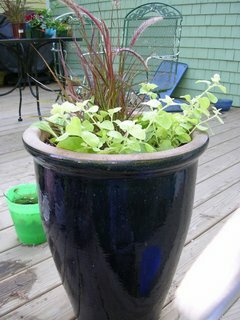 I love this pot, so I thought we'd use it on the deck this summer before attempting another lemon tree this fall. The pot formerly held a Meyer lemon, which actually did well enough to produce lemons for three years, but succumbed to a combination of scale and spider mites this past winter. Apparently the shopping was the key to happiness, becasue on the way home, the clouds thinned and the sun appeared. It was still to wet to mow or get into the vegetable swamp, so instead we planted the new purchases, and did some pruning in the front of the house, where the lilacs were too close to the roof and the spent flowers had clogged the gutter. 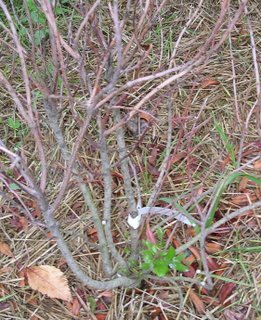 We also pruned off all the dead branches off the bayberry bushes we planted last fall, and which we thought had not survived. 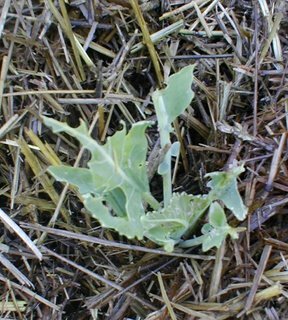 Perhaps the abundant moisture of the past few weeks were what they needed, for tiny little leaves are sprouting near the base of each shrub. The national weather service forecast this week is predicting overcast with a chance of showers every day this week. I hope we see a few more glimpses of sun, so the vegetable garden dries out a bit, and the temperatures warm enough for the pollinators to do their thing with the blackberries. It's soon to be summer and I have a hankering for blackberry pie. 2 3/4 just in the last 36 hours. Rain is the top news story here at Henbogle. Today at last, we had a break from the rain; there was even a short-lived ray of weak sunshine near mid-day. After all this rain, though, we can definitively say, that Henbogle House does not leak. The chicken palace is as dry as it can be when inhabited by 6 chickens in 98% humidity. The girls did get outside a bit today, and seem very pleased to be out, running about and flapping their wings. The ground in their pen is pretty wet, but there are no puddles yet. I wish I could say that for the vegetable garden. This morning, there was standing water in the garden, particularly in the potato patch. The potatoes, planted 2 weeks ago, have yet to sprout, and I’m wondering if they will given all this rain. In addition to the wet, the wretched dog has been roaming about in there, leaving deep, muddy footprints. Arghh. The broccoli and cauliflower, however, look good I am happy to report. 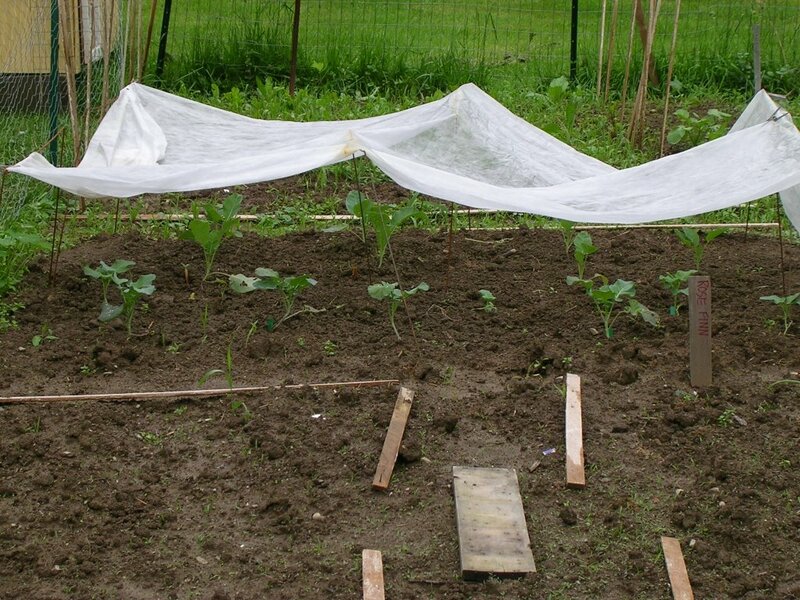 The floating row cover seems to be protecting them from the evil groundhogs next door. Apparently, they do not like going under the covers. This worked for the lettuce bed in the past, and so far so good for the cole crops. As for the rest of the garden, it is in a sad state. It was weedy before we went away last weekend, but 7 days and 6 inches of rain later, it looks like weeds are our primary crop. Ugh. More rain is forecast right through the weekend, and it is so muddy and wet I’m afraid to get in there and weed, let alone try and plant the rest of the crops. Hmmm. 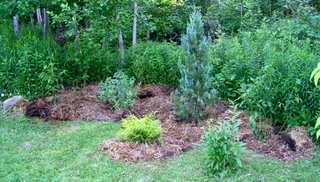 The ornamental gardens don’t look so bad; in fact, the new hemlocks seem to be soaking this right up, although their neighbors the hybrid lilacs are looking a bit beat up, and the new seedlings of oriental poppy, echinacea cv. White Swan, and nicotiana I added to the extension of the side border have been mashed into pulp -- their survival does not look likely. 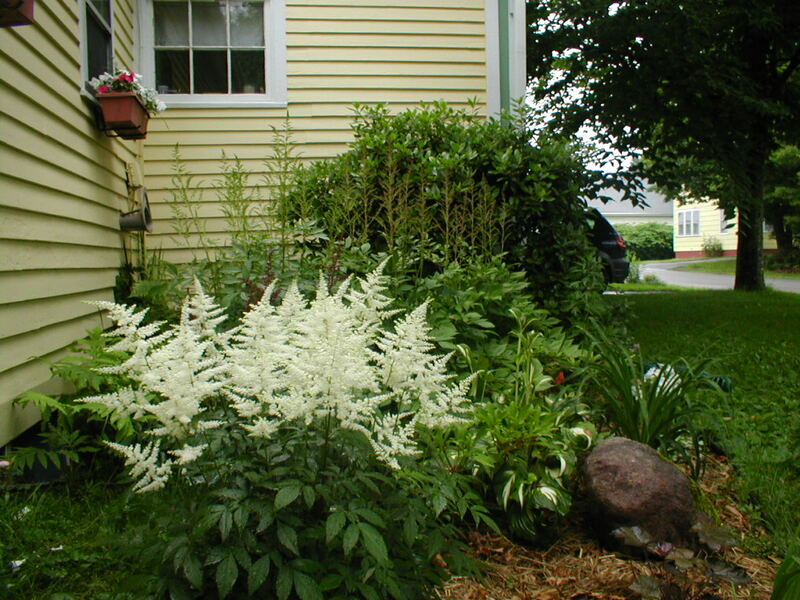 Most of the other plants look lush and green, with the exception of a few that have been beaten down. 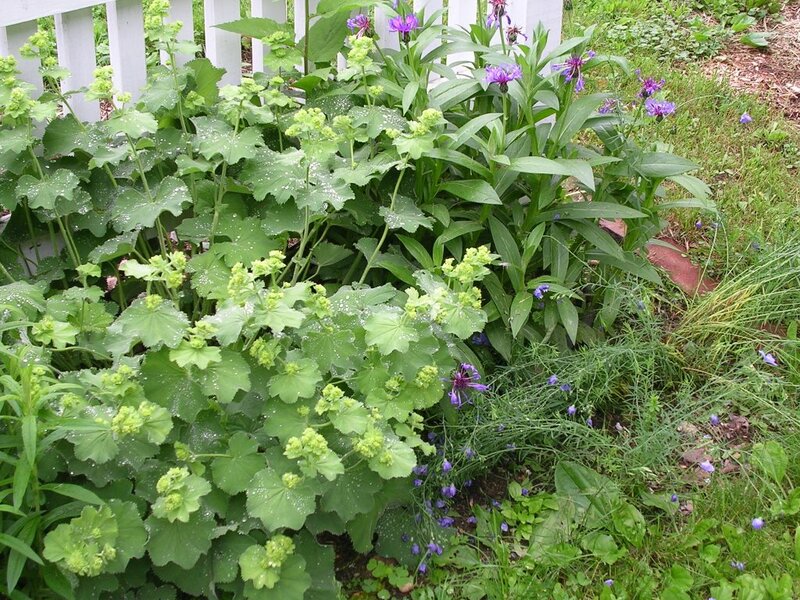 The perennial flax is having a very bad hair day – it usually shines with lady’s mantle and mountain bluet. Our new gardens (formerly front lawn) are filling in nicely, although I have some tweaking to do still. The asitlbe is exceptionally happy here, thus are taking over so I need to give them some more room. The Northern Lights series azalea cv. Lemon Lights which I bought last year is a surprise, being a very orange shade of yellow. I guess it serves me right, as I purchased it at the end of the season at deep discount from an evil big box store. I am guessing it is a Mandarin Lights azalea. The original plan called for the astilbes to move in front of the azalea once it grew a bit, but I’m re-thinking this now that I need to replace the azalea, orange not being one of my colors. Maybe back near the new purple ninebark? That might look nice together. 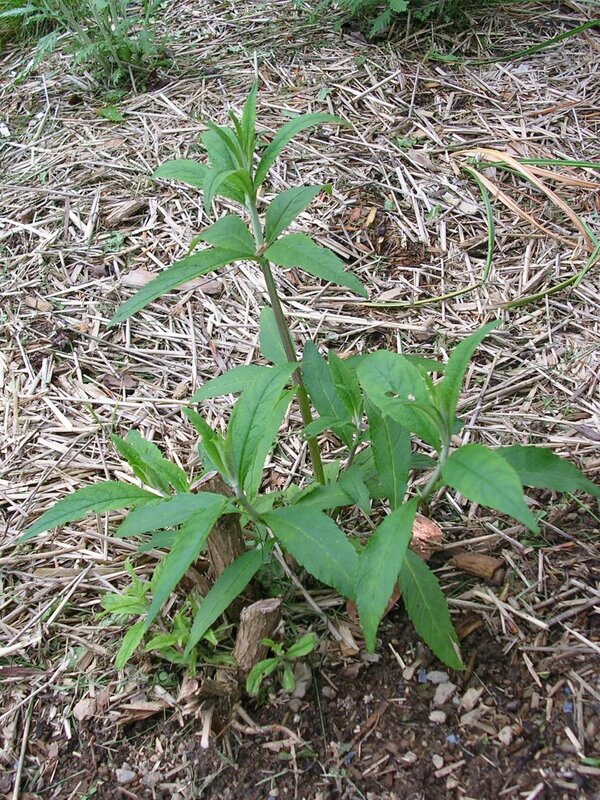 The butterfly bush is finally leafing out, I was afraid I’d killed it after all. I’m now wondering if I cut it back too hard this spring. 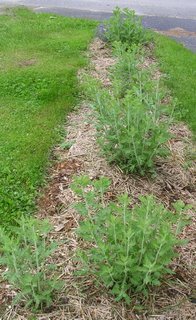 The Russian Sage, on the other hand, is coming along splendidly, really filling in to form a nice low summer hedge, exactly as I was hoping it would. Something is right with the garden, rain be damned. 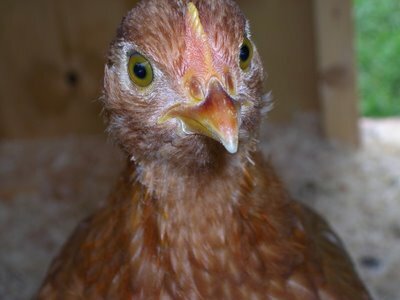 Yet another article questioning the backyard flock's connection to bird flu, again siting the study by the organization Grain. 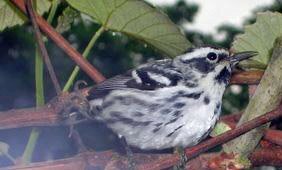 We had a beautiful visitor this morning in the grapevine arbor, a black and white warbler. I love the grapevine arbor! We zipped up to southern Vermont for the day on Saturday, originally intending to go to see the Strolling of the Heifers in Brattleboro. 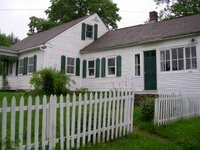 The steady rain kept us away from the heifers, but we did visit my friend Carol and saw her new home, an old Vermont farmhouse on 3 acres. Carol and her partner Bruce have lots of plans for the house, and Bruce is already hard at work on some of them, including their current project, gutting and renovating the bathroom. 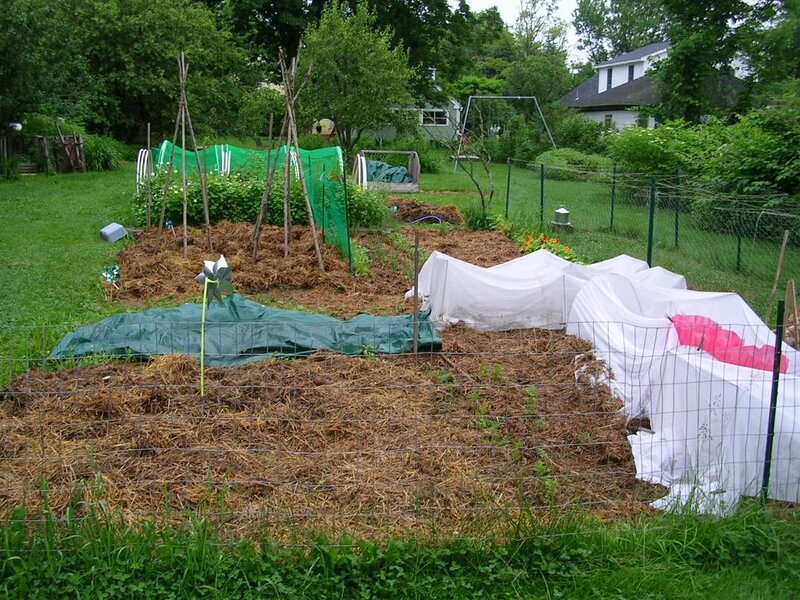 Gardening projects also abound, they are currently planting large vegetable gardens, and some strawberries. The steady rain made the garden tour a bit wet but clearly she has lots of potential, including a huge lilac hedge between her house and the road, and a spectacular beauty bush that was in full bloom. 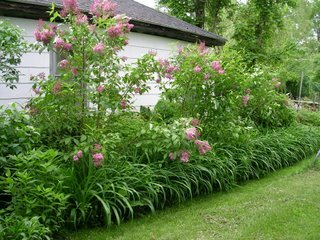 The bush was huge, it must have been planted many years ago, and was in full blossom, just covered with light pink tubular flowers. The hummingbirds must love it. 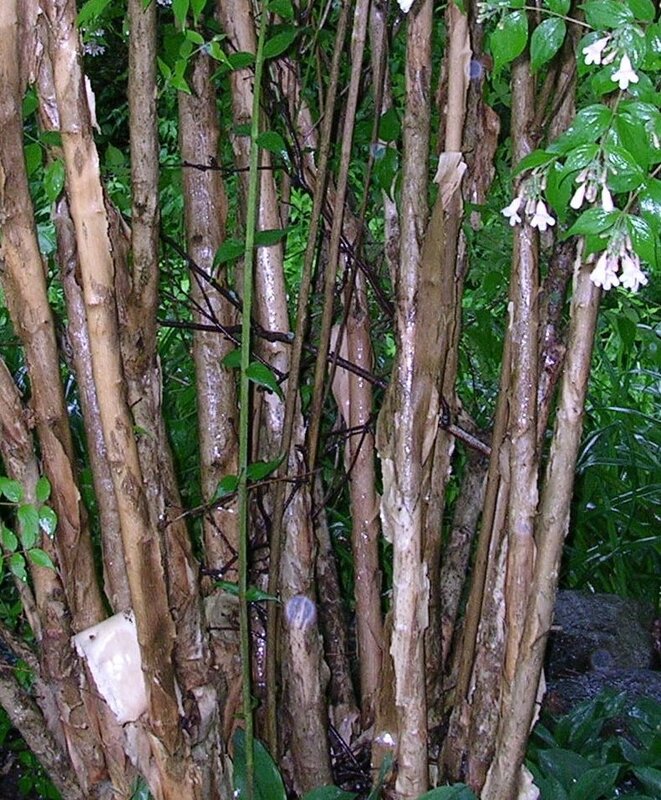 I tried to show in the photo the interesting peeling texture of the bark, which will add some winter interest. Note the large trunk remaining on the left after a past pruning. Carol had lots of pale lilac iris, oriental poppies, some old roses and more. 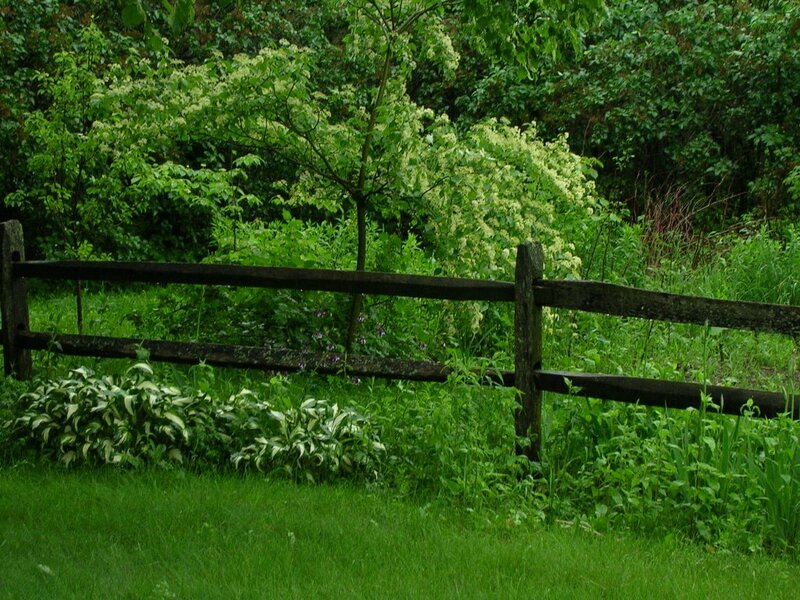 A giant bleeding heart nearly covered one end of the split rail fence. 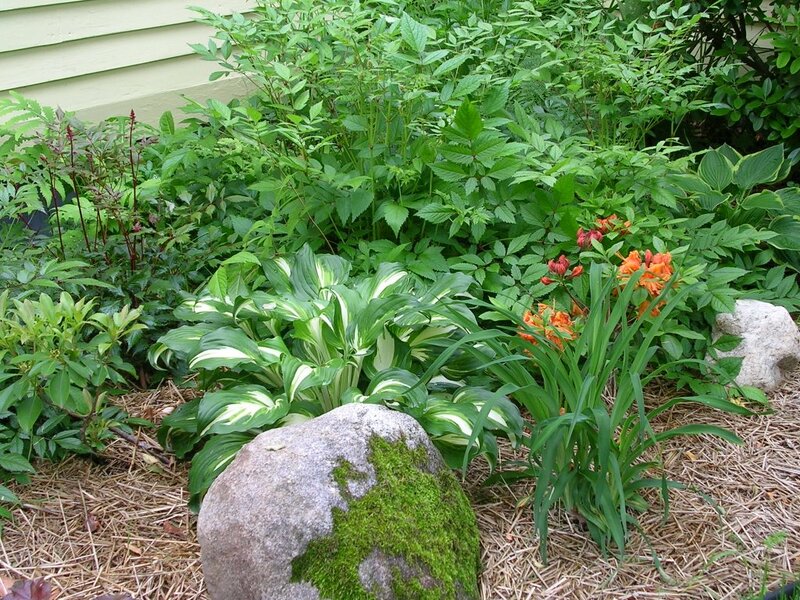 In all, a gorgeous palette to work from as she settles in and has more time for gardening when some of the more immediate house projects are done. In the back yard, a split rail fence divides the la wn from vegetable beds, currently planted with garlic and potatoes. Just beyond the fence at one end is a native dogwood, and the entire vegetable bed area is surrounded by a lilac hedge. Through the lilac hedge are more vegetable gardens, or in this case, a big strawberry bed. Beyond that area is fenced in pasture. The future will call for some livestock I'm sure. 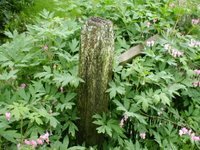 As we drove to town to get some lunch, we saw a huge plant --over four feet and still growing -- on the side of the road in a boggy area, where the road had washed out recently, and new culverts installed. If there had been pavement, the tires would have screeched as we stopped to look, speculating that we might be seeing a giant hogweed, considered a noxious weed as the sap causes severe dermatitis in most people. We sent Dan into the rain to document the plant, with cautions against touching it or brushing against it accidentally. 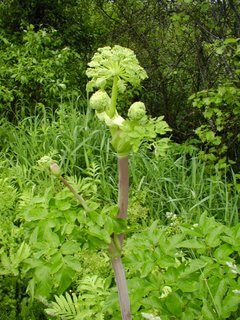 Once we got home, I looked it up and discovered it was instead wild angelica, angelica sylvestris, which is often mistaken for hogweed. 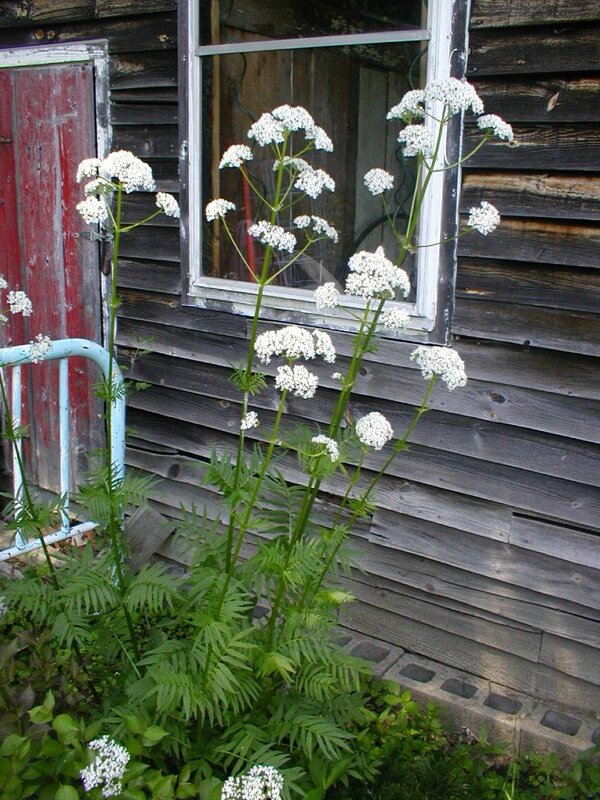 It would be spectacular in the back of the border, I will need to do some research and see if it is suitable and not likely to become overly aggressive towards it garden mates.